A Sales Portal is an online interface that increases sales effectiveness by delivering actionable information and tools that help salespeople close deals. It can be recognized as an internal collaborative community for the organization as well. Provide your sales reps instant access to critical information via Sales Portal to enable them to make more informed sales decisions. Sales Portal enables sales reps with comprehensive customer information, such as order history, products purchased, payment history, key contacts, open opportunities, and quotes. Sales representatives equipped with this information can easily identify and leverage cross-selling and up-selling opportunities for customers. 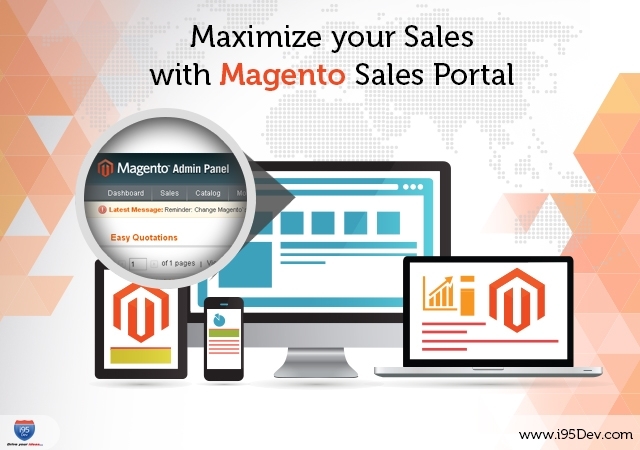 Each salesperson has individual log-in to the sales portal. You will have control over which customer profiles they can access with the ability to limit sales representatives to their customers’ profiles only while sales managers can view all customers. You have right to assign permission and restrict what each user can and cannot perform while using this solution. Businesses can use this to measure and calculate sales commissions automatically based on sales made by them. You can automate, manage, and track generation of leads. You can evaluate and distribute leads in real time using flexible, rule-based business logic. You can even manage and track lead follow-up. Sales Portal empowers you with multi-language, multi-currency capabilities. It allows you to create and manage customer quotations or RFQs for your new and existing customers’ right from your store with real-time access to product, pricing and stock information while preparing the quotes. You can create virtual global teams by sharing leads, opportunities, quotes, contacts, notes, tasks, and more while using this solution.